For information about the Fishing Skill, see the Fishing page. For an index to the completed fish collection, see Collections. For the guide to catch all fish, see Fishing Strategy. Fish are catchable when fishing using a fishing pole. They can be found in the ocean, lake or river, and some are unique to either day or night or only appear when it rains. Fish are used in cooking and the fishing community center bundles. The length of each fish type is recorded, and viewable on the collection screen. When a fish is hooked a window appears with a fishing mini-game. The player must move the highlighted area up or down to keep the fish inside it. While the fish overlaps it the catch meter will fill, while the fish is not inside the area it will decrease. If the catch meter fills completely the fish is caught, if it becomes completely empty the fish escapes. If the fish does not leave the meter boundary once, you will receive a "perfect" notification. When playing the fishing mini game with mouse and keyboard, when one presses the left mouse button down, the bar raises but lowers if the left mouse button is not pressed. This means that you want to use left mouse pulses to actually raise the bar, not merely clicking, as a moderately fast series of clicks will just hover the bar stationary. Mixed: These fish use the basic movement pattern. Smooth: These fish have a more steady movement pattern. Sinker: These fish have a faster downwards acceleration. Floater: These fish have a faster upwards acceleration. Dart: These fish move more random with a [2 x difficulty]% higher possible amplitude in both directions, moving erratically up and down the fishing bar. See the fishing page for more details about equipment, mechanics and things unlocked as the fishing skill levels up. Anchovy A small silver fish found in the ocean. Tuna A large fish that lives in the ocean. Sardine A common ocean fish. Bream A fairly common river fish that becomes active at night. Largemouth Bass A popular fish that lives in lakes. Smallmouth Bass A freshwater fish that is very sensitive to pollution. Rainbow Trout A freshwater trout with colorful markings. Salmon Swims upstream to lay its eggs. Walleye A freshwater fish caught at night. Perch A freshwater fish of the winter. Carp A common pond fish. Catfish An uncommon fish found in streams. Pike A freshwater fish that's difficult to catch. Sunfish A common river fish. Red Mullet Long ago these were kept as pets. Herring A common ocean fish. Eel A long, slippery little fish. Octopus A mysterious and intelligent creature. Red Snapper A popular fish with a nice red color. Squid A deep sea creature that can grow to enormous size. Sea Cucumber A slippery, slimy creature found on the ocean floor. Super Cucumber A rare, purple variety of sea cucumber. Ghostfish A pale, blind fish found in underground lakes. Stonefish A bizarre fish that's shaped like a brick. Ice Pip A rare fish that thrives in extremely cold conditions. Lava Eel It can somehow survive in pools of red-hot lava. Sandfish It tries to hide using camouflage. Scorpion Carp It's like a regular carp but with a sharp stinger. Sturgeon An ancient bottom-feeder with a dwindling population. Females can live up to 150 years. Tiger Trout A rare hybrid trout that cannot bear offspring of its own. Bullhead A relative of the catfish that eats a variety of foods off the lake bottom. Tilapia A primarily vegetarian fish that prefers warm water. Chub A common freshwater fish known for its voracious appetite. Dorado A fierce carnivore with brilliant orange scales. Albacore Prefers temperature "edges" where cool and warm water meet. Shad Lives in a school at sea, but returns to the rivers to spawn. Lingcod A fearsome predator that will eat almost anything it can cram into its mouth. Halibut A flat fish that lives on the ocean floor. Woodskip A very sensitive fish that can only live in pools deep in the forest. Void Salmon A salmon, twisted by void energy. The fresh meat is jet black, but rapidly turns pink when exposed to air. Slimejack He's coated in a very thick layer of slime. He keeps slipping out of your hands! These fish can only be caught in the submarine ride at the Night Market during Winter 15-17. They can be caught during any weather, and at any time while the market is open (5pm – 2am). Due to the small size of the fishing area, it may be impossible to catch gold quality fish in the submarine. Midnight Squid A strange and mysterious denizen of the ocean's twilight depths. Spook Fish The huge eyes can detect the faint silhouettes of prey. Blobfish This odd creature floats above the ocean floor, consuming any edible material in its path. In addition to the 3 fish listed above, Sea Cucumber, Super Cucumber, Octopus, and Seaweed can be caught in the submarine. There is also a 0.4% chance of catching a Pearl. There are five fish in the game classified as 'legendary'. These fish are caught in specific places and have a high difficulty. When reeling them in, these fish are shown wearing a hat. With the exception of the Legend, legendary fish will not appear again after being caught once. Legendary fish can be caught at any time of day. There is a Lost Book named "Secrets of the Legendary Fish" which contains the seasons and the locations of the legendary fish. The highest fishing skill plus food bonus (e.g., from Lobster Bisque), the Iridium Rod, Bait, and Tackle like the Trap Bobber or Cork Bobber may be necessary to catch legendary fish. Catching the most difficult of them depends more on luck than on good reactions. You simply have to try again and again until the fish doesn't move too fiercely. Crimsonfish Lives deep in the ocean but likes to lay its eggs in the warm summer water. Angler Uses a bioluminescent dangler to attract prey. Legend The king of all fish! They said he'd never be caught. Glacierfish Builds a nest on the underside of glaciers. Mutant Carp The strange waters of the sewer turned this carp into a monstrosity. All of these creatures can be used as components in the Crab Pot Bundle. Some are only catchable using a baited Crab Pot. Crabs drop from Rock Crabs (15%) and Lava Crabs (25%); Clams, Cockles, Mussels, and Oysters can be foraged on the beach. Between beach foraging and Rock/Lava Crab loot it is possible to complete the Crab Pot bundle without the use of a crab pot. Baiting the rewarded crab pots however, is not possible without first reaching level two in fishing, or viewing Linus' 4-Heart cutscene. Note that any fish dropped by monsters or foraged from the beach do not count towards the fish collection. They must be caught with a pole or in a crab pot. Foraged fish can be of normal, silver, gold, or iridium quality. Fish caught in crab pots are always normal quality. All Crab Pot fish are worth 5 XP. Lobster A large ocean-dwelling crustacean with a strong tail. Clam Someone lived here once. Crayfish A small freshwater relative of the lobster. Crab A marine crustacean with two powerful pincers. Cockle A common saltwater clam. Mussel A common bivalve that often lives in clusters. Shrimp A scavenger that feeds off the ocean floor. Widely prized for its meat. Snail A wide-ranging mollusc that lives in a spiral shell. Periwinkle A tiny freshwater snail that lives in a blue shell. Oyster Constantly filters water to find food. In the process, it removes dangerous toxins from the environment. There are some consumable non-junk catches players can reel in while fishing. They do not trigger the fishing mini-game, but are instead immediately picked up. Each gives 3 Fishing XP when caught. All three can be used in cooking, most notably Seaweed in the Maki Roll recipe for the Chef's bundle. 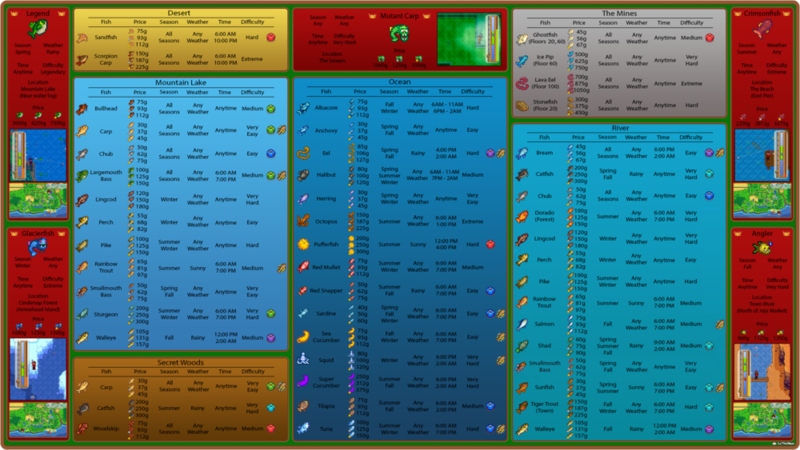 Location suggestions, collection chart, and time breakdowns by location and season are included in Fishing Strategy. Below is a quick reference table showing when it is profitable to turn fish into Sashimi based on the quality of the fish. Fish that never make a profit when turned into Sashimi are not listed (Crab, Crayfish, Lobster, Legendary Fish, etc.). *Turning Sardines into Dish o' The Sea to temporarily increase Fishing Level may be a better choice. This page was last modified on 19 April 2019, at 21:15.